The idea behind Matcha May is to get people talking about all things matcha, and to tell everyone and anyone who will listen just how great it is. I’ve been drinking Matcha for quite a whole now and it definitely gives you more energy. I’d also agree that it is more slow releasing than your regular tea, coffee or bottle of coke. This means that you don’t get that mid morning, pre-lunch caffeine crash! As much as I love Matcha I won’t lie to you, it can be a bit of an expensive habit. If you have the money then I highly suggest you take it up and keep to it – especially if those stats are correct. Because it’s a little bit pricey I’ve always been a bit wary to experiment with it, instead I simply drink it in the traditional way (or as close as you can get to doing so in an English town.) But I’ve finally decided to see what else Matcha offers in terms of cooking. Although it was originally only used in Japan for tea ceremonies it is now used in a whole variety of dishes such as green tea ice cream, I’ve even seen it used to flavour and colour soba noodles, and it is also used in Wagashi which is a Japanese confectionary. Thinking about Wagashi led me to think of other sweet dishes I could cook using this special tea. After careful consideration I decided to do a twist on a classic. 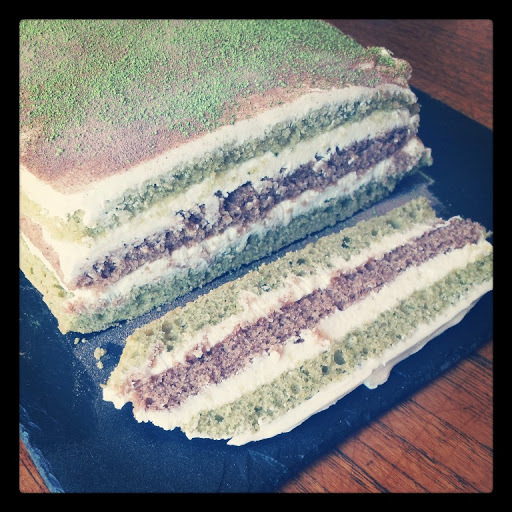 What if instead of making tiramisu with coffee…I made it with Matcha tea! And so the Matcha Tea-ramisu was born. 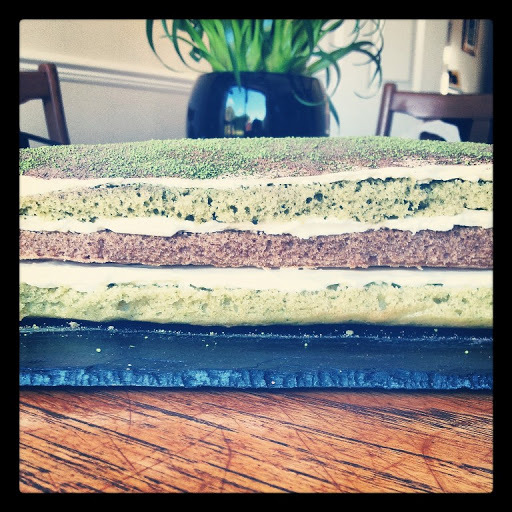 The idea is simple – I take layers of Matcha flavoured sponge and layer it with a mascarpone mix and chocolate sponge. The top is sprinkled with extra Matcha and cocoa powder for a tasty treat that you don’t have to feel guilty about. It’s worth noting that my recipe not only differs from traditional tiramisu by using green tea instead of coffee, but it uses baked sponge layers rather than lady fingers and the mascarpone cream filling is egg free! This means its ok for people who can’t eat raw egg. Because of this it really is an incredibly simple recipe that is tasty and is visually awesome to look at. A bright green cake really is a show stopper! I’d recommend eating this recipe for afternoon tea out in the garden but it can be eaten as a dessert after dinner. To make the cake layers, cream together the butter and sugar in a bowl until creamy and smooth. Beat in the eggs one at a time until the mixture is light and fluffy. Separate 1/3rd of the mix into another bowl. To this bowl add 50g of the flour and the cocoa powder. Fold the mixture in. To the bowl containing 2/3rd of the cake mix add the remaining 100g of flour and 1 tsp of matcha. Fold until fully combined. Spoon the chocolate cake mix into a small rectangular tin lined with grease proof paper. Bake at gas mark 3 for 15mins or until springy to the touch. Once cooked turn out on a cooling rack. Line the tin again and spoon the green cake mix into the tin. Bake at gas mark 3 for 15mins or until springy to the touch. Once cooked turn out on a rack. Cut the cake in half to create two layers the same size as the chocolate layer. Allow to cool. Once the layers have cooled whisk together the caster sugar and mascarpone. Spread a third of the mix over one of the green layers and put the chocolate layer on top. Spread another layer of mascarpone over and place the last layer on top. Spoon over the remaining third of the mascarpone. Sprinkle the top of the cake with a tsp of cocoa powder then finally a tsp of matcha. 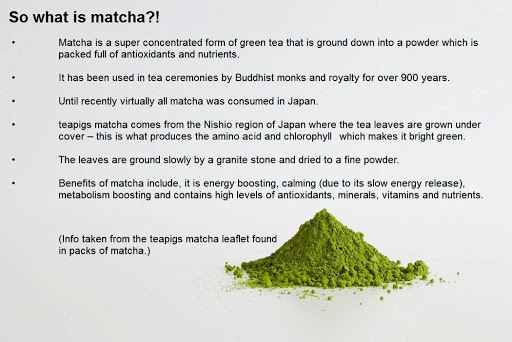 So there you have it, Matcha is not just for drinking! Is there any end to this marvellous tea’s talents? Just one scour of the internet and you can find hundreds of recipes using this amazing powder. So if drinking it straight every day isn’t for you. I’m sure you will find something else a little more to your tastes. As much fun as it is making bright green cakes without the aid of liquid and gel food colourings I think for the meantime I will continue to drink it each morning in the traditional way. I think it will become handier as I go out to work in the big City. You can also follow teapigs on Facebook and twitter: @teapigs. This looks really lovely. I made a matcha tiramisu a while ago and loved the flavour but the way you've incorporated the matcha into the cake is much more elegant! Thanks Foodycat! How did you make yours?! What temp and how long to bake if using an oven? I’m not sure what a gas mark 3 is?